(Routledge, 2016) 162 + x pp. Reviewed by Fang Li on 2018-05-05. This is a text marbled with other texts. Some--such as the novels of Austen, Hardy, Gissing and the poetry of Elizabeth Barrett Browning--will be very familiar indeed to the reader of nineteenth century literature. Others, which will be utterly and delightfully new, include a parody paper put out by Austen's brothers, the journal of the first women's college at Oxford, a "Popular Educator" (126) that aims to instruct working men in moral philosophy and indoor plumbing, and the summer program of the National Reading Union, which includes edifying lectures on the Elgin marbles and vocal music for children. Besides three great advantages to this marbling of texts, however, I can think of some distinct disadvantages. Let us first marvel at the advantages. In the first place, Sheila Cordner successfully shares the excitement and wonder of her primary research. She reads familiar texts like Emma, Jude the Obscure, and Aurora Leigh just as refreshingly as she reads the quirky genres we barely recognize as ancestors of the Harvard Lampoon, women's studies, popular mechanics, and the BBC proms. Second, the author (finally!) does some justice to the role of class in connecting the authors of these diverse texts. The distinction she makes between insiders and outsiders, or betwixt inliers and outliers, may be clear and stable as--well, the morning fog; but the main point she clearly makes is that none of these writers were independently wealthy (3). Also, she always treats their economic status as a necessary part of their attitude towards writing and towards the academy, even if she does not always draw from it all the inferences that she might. Thirdly, the book conveys a real awareness of the other meaning of the term "outlier"--that is, a unique, non-repeatable, and thus non-representative case (1). Cordner makes no attempt to argue that her success stories are anything more than stories of a remarkable few, and whether their success sprang from chance or talent is not as interesting as the marks that their success has left on the polish of their productions: the overcompensation of the autodidact, the resentment of those who found only obscurity by following the well-trodden road, and--most interesting of all--what these outliers tell us about our whole method of approaching literature, and therefore education. They cast doubt on our habit of approaching literature through the median or the mean instead of through the exceptional and therefore extreme. It is really only by appreciating the polish and finish of this book that one detects certain flaws--often a logical consequence of its virtues. First of all, the book as a whole falls into a very recognizable genre: a PhD thesis rewritten as a first book. Paradoxically, this means that there are still traces of the insider's address to other insiders, and the gravest example of this fault is taking for granted the basic claim that exclusion leads to innovation. For even though the sub-title identifies exclusion as innovation, the character being excluded in Jude the Obscure is hardly innovating. When Jude Fawley constructs a special frame so that he can study his Latin dictionary while driving a cart (55), he is learning by rote, not texting while driving. To the insider, the accomplishments of rote learning may not seem worth the trouble, but they are worth it for genuine outsiders trying to accomplish the results of rote learning without institutional support. While the dissatisfied insider takes the lack of such support as an innovative shortcut, Hardy's Jude finds it an exhausting detour. To him the "accidental" in what Cordner calls "accidental reading" (7, 54-55, 94-95) does not mean serendipitous or even fortuitous. It means something closer to calamitous. A second flaw in this book springs from the problem of defining what Virginia Woolf called "all those grades of society that lie between the working class and the upper class" (The Pargiters, qtd. 103). As Thomas Piketty points out, Austen's novels are entirely set in social situations involving the top ten percent of society but nevertheless well below royalty and even tangential to the hereditary peerage (Capital in the Twenty First Century, 105-106). By contrast, Hardy's fiction includes far more of the intermediate grades, and whether you take class as essential and education as accidental or vice versa, any generalizations made to include them both will be a very loose fit. In a topic as large as education in nineteenth century British literature, there are bound to be fine distinctions that make a difference--and coarser, more visible distinctions that make no difference at all. Sometimes, it must be said, Cordner seems to focus on the latter rather than the former. Take, for example, the gap between Emma Woodhouse and Harriet Smith. According to Cordner, the key difference is that "Emma's tutored education prevents her from embracing the disorder Austen calls for in her ideal pedagogical model" and forestalls her "regenerative" attempt to pass on her education to Harriet (35). But in Chapter Eight of Emma, Mr. Knightley refers to a finer, less visible distinction. Harriet, he says, is "the natural daughter of nobody knows whom, with probably no settled provision at all." Is it education that makes the essential difference between Emma and Harriet, or is education simply the accidental effect of birth, position, and wealth? A third problem with this book is even more clearly a methodological one. According to Cordner, Austen's alternative model for women's education is "scrambling," which Cordner uses for a chapter title (35): specifically "scrambling" through Mrs. Goddard's finishing school. A search shows that in the six novels Jane Austen wrote, "scramble" is used four times: once in Emma, as Cordner says, and thrice in Mansfield Park. But there it is used to describe various transgressions at the Rushworth estate by the Bertram sisters. Can such a word signify a whole theory of education? Since this putative theory is an outlier, it should be much easier to find textual evidence of the "traditional" theory of education that Cordner's authors are supposedly united in opposing. Yet this book offers no clear definition of such a theory, or rationale for it, or even a statement supporting it. On the contrary, even Matthew Arnold, "Inspector of Schools as well as an insider of elite school culture" (8), sounds much like the outsider authors in discouraging rote learning and encouraging independent thinking. So just to know how much this outlier perspective really does differ from the "inlier" view, we will have to look well outside literature. Our literary canon is always biased towards texts that are exceptional, and the exceptional can be exclusive in many different and sometimes incompatible ways. 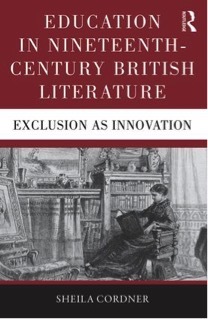 Where Cordner's book succeeds in representing education through nineteenth century literature, it is because novels themselves represent a historical exception to the exceptional when they start to represent everyday life within the canon of exceptional texts. When Frederic Jameson exhorts us to "always historicize" (The Political Unconscious, 1981), he is reminding us that in the nineteenth century--much more than today--novelists were still outsiders to canonical education and its literary canon and also to the ordinary, everyday life of the majority of British people. But they were already becoming insiders to both and catalysts for breaking down the division between them. Consider the lines crossed by the word "marbled." The Victorians used it to describe both the newly pilfered Parthenon friezes on display at the British Museum and the daily meat that maidservants were sent to purchase at London's Berwick Street Market. In Tristram Shandy, the novel Tristram intends to write but perpetually postpones is sometimes represented with pages that are black or utterly blank. But sometimes they are--most appropriately--marbled. Fang Li is a Faculty Member in English Language and Literature at the Hankuk University of Foreign Studies, Seoul, South Korea. Leave a comment on Fang Li's review.